IMG Limited > Blog > Blog > Blocked Drains – The Triple Threat of Fat, Oils and Grease! Blocked Drains – The Triple Threat of Fat, Oils and Grease! Blocked, smelly or slow-moving drains are a nightmare and the main culprits tend to be fat, oil and grease. Even though we all know they shouldn’t go down the drains they always seem so harmless in their liquid form and the temptation is to just pour them away. Once in the drainage system the fats start to cool down and as they do they become congealed and hardened (Sorry if you are having your lunch!). They then stick to the inner lining of the drain pipes and there you have the beginning of a blockage. Slow-moving, ineffective drainage and bad smells. A completely blocked drain system creating dangerous, unhygienic and very unpleasant conditions. This is a threat to your business, staff and customers so it’s important to get it sorted before it causes chaos. Major drain blockages, if left untreated, can mean calling out expensive drain rodding or jetting services so prevention, as always, is better than the cure! 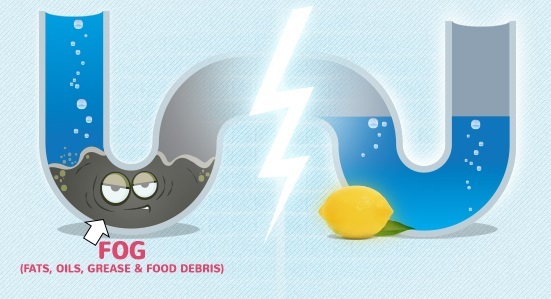 Using bleaches and detergents to try and solve the problem can appear to help with smelly drains but this is simply a temporary effect as the build-up or blockage will simply turn back to solid fat and continue to accumulate. Give the team here a call and ask about 2 most popular and effective products for blasting away fats, oils and grease so they can’t cause you problems. EXOCET is a lemon scented, strong caustic granule that will rapidly clear blocked or slow running drains of fat, oil, grease and hair. ENZYME PLUS is a concentrated biological treatment which, using a Drainworks Dosing System, constantly digests Fats, Oils & Greases to maintain a good flow in drain lines and prevent blockages. Our friendly team at IMG are always here to help answer your questions and advise you on the most effective product for your needs. We have a huge range of advanced and highly effective industrial maintenance products.